When I worked on the previous post - I'm going to be honest with you - I did not plan to show you the CL_SALV_COLUMN class, so I had to rethink my code, before we jump into the middle of coding. First, I extracted the definition of the reference variable, called columns (CL_SALV_COLUMNS_TABLE) from the OPTIMIZE_COLUMN_WIDTH subroutine into the global definition area for the sake of the simplicity, since we are going to reuse this instance later several times. Then, I moved the initialization of the columns reference variable from the OPTIMIZE_COLUMN_WIDTH subroutine into the INITIALIZE_ALV subroutine, since we want to initialize only once, and reuse it several times, so I think it belongs to this place. At last, this is the result of the OPTIMIZE_COLUMN_WIDTH subroutine. It's short, compact, and transparent! That's what I like. As you have completed the necessary code refactoring as well, let's move on and work on our current task, perform individual setting on certain columns. As you could see, we display all of the columns from the SPFLI table in our ALV list without any restriction. Now, I want to teach you how you can hide the unnecessary columns in your ALV list. As an example, let's hide the column, MANDT since it's a technical fields, the user doesn't interested in the content of this fields. It's going to be very simple: first of all let's get the reference of the MANDT column by calling the method, GET_COLUMN() on the columns object (columns contains all of the columns from the table, SPFLI), and then let's call its method, named SET_VISIBLE() with false. At last, let's wrap these method calls into a TRY-CATCH block to handle exceptions (now we have to handle the case when doesn't exist any field in the structure with the name, MANDT). Above, we used a reference variable, named column that we have not declared yet. 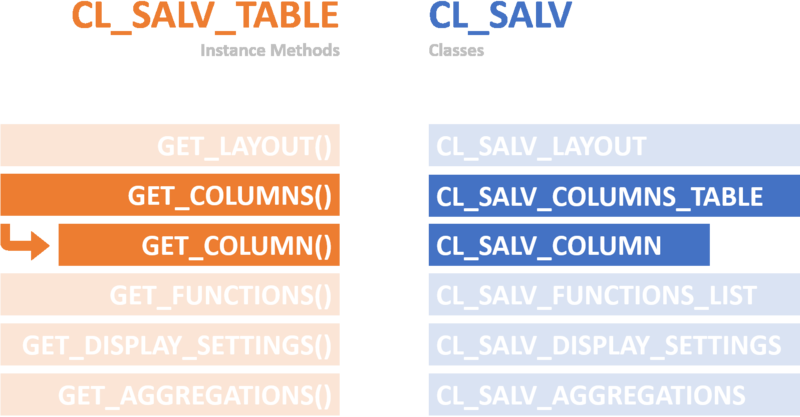 Let's place its declaration in the global area for the sake of the simplicity with the type CL_SALV_COLUMN. Beside the field's visibility, I want to show you another setting that you can use to reset column's texts (that is specified in the ABAP Dictionary) easily by coding. Here, we are going to do the same thing. First let's get the reference of the COUNTRYFR field by calling the GET_COLUMN() method, and save it in the variable column. Then call the different text setting method according to the lengths: short, medium, long with the different texts that you want to set. At last, handle the CX_SALV_NOT_FOUND exception, in the case when there is no field with the name COUNTRYFR. Finally, that's what we worked on the last few minutes: column Mandt is hidden, the column Departure Country's texts are renamed. I think, we are on the good way :) You are getting close to master the CL_SALV_TABLE class step by step. First, we implemented a simple list, then we enabled the layout settings, after that we optimized the column width, and now we hid the MANDT field, and set the texts for the COUNTRYFR field.